This stretch contains only the hillfort of Stantonbury Camp, which is located just inbetween the cities of Bristol and Bath. Stantonbury lies within view of most parts of West Wansdyke, and may have been crucial to the choice of terrain by the builders. Stantonbury is covered with trees, so most of the views will unfortunately remain hidden. As the land around this Iron Age hillfort belongs to the Duke of Cornwall, one is advised to stick to the paths when visiting this site. By car from Bristol. Follow the A 4 (T) to Bath, then take the A 4175 to Keynsham, and next the B 3116. 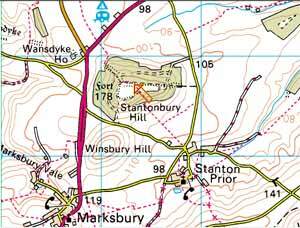 Now either park the car at Wansdyke House, or drive towards Marksbury and take the road to Stanton Prior, before setting out on foot for the fort. There are two main footpaths to the fort, one starting from the A 39, just east of Wansdyke House. The other starts from the centre of Stanton Prior. By car from the directions of Bath. Follow the A 4(T) to Bristol, and take the A 39 through Corston. Reaching Wansdyke House below Stantonbury Hill, continue as described above. From Weston-super-Mare and the M5, follow the A 371 to Bristol and the A 368, all the way to Marksbury. Then either go straight to Stanton Prior, or park the car upon reaching Wansdyke House, and go further on foot. From Wells, follow the A 39 and after reaching Marksbury continue as described above. From Shepton Mallet, follow the A37 to Bristol. Take the A 368 right to Bath, and after Marksbury, continue as described above. click here to return to West Wansdyke, section 3.